Earlier in the year Alissa and I were lucky enough to dine at Attica, the Melbourne restaurant hailed by many to be the best in the country. Located south of the CBD in Ripponlea and featuring a stark black and white fit out, Attica does not have the incredible views, opulent decor and central location of a Vue de Monde or a Quay to fall back on; more than both those esteemed restaurants, the success of Attica is largely the result of the incredible food of head chef and co-owner Ben Shewry. Terroir driven, hyperlocal, ethical and deeply personal, the unique and often autobiographical nature of Shewry's food marks him as a culinary auteur, and our meal at Attica was one of the most artistically satisfying of my life. Shewry has fast become one of my culinary heroes. 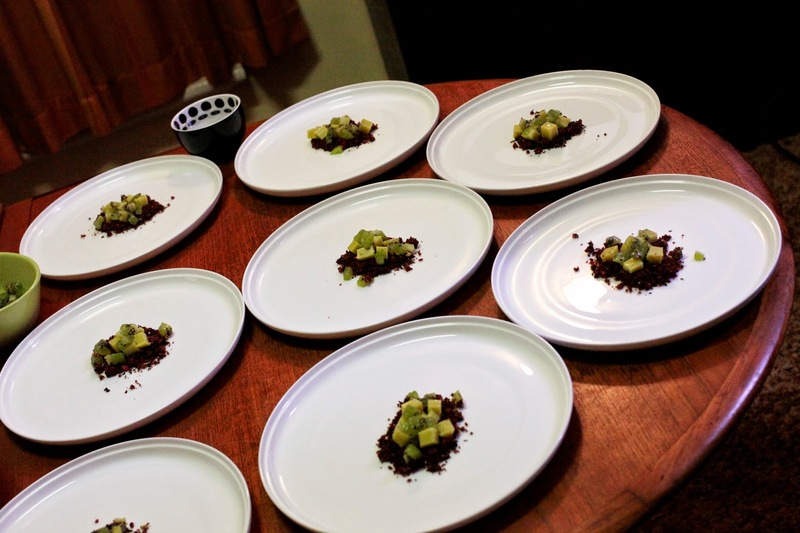 When we began planning our Ministy of Gluttony at Home dinners, I knew I wanted to follow up the Molecular Gastronomy-heavy Fat Duck themed dinner with a meal that focused on the more recent trends in Modernist cooking such as foraging, growing specialist herbs and using native produce. Being very much in vogue, there are many restaurants throughout the world with a similar philosophy - D.O.M, Faviken and Noma come to mind - but their food is impossible to replicate outside of their geographic range due to the liberal use of uncommon and hyperlocal ingredients. Since Alissa and I live in Australia and have access to ingredients like great local produce like marron and saltbush, an Attica themed menu seemed like the most logical and achievable choice. Joining us for the meal were a few repeat guests - my parents (who attended the Momofuku Ko dinner, with my Mum photographing the final dishes again), Hayley Bahr (who has attended all but the Momofuku dinner) and Ben Basell (who attended all four), with Alissa's brother Ben Claessens and his partner Kelsey Diamond joining us for the first time. Always moving forward, most of the dishes in Shewry's cookbook Origin are either no longer served at the restaurant or are earlier versions of dishes on the current menu. 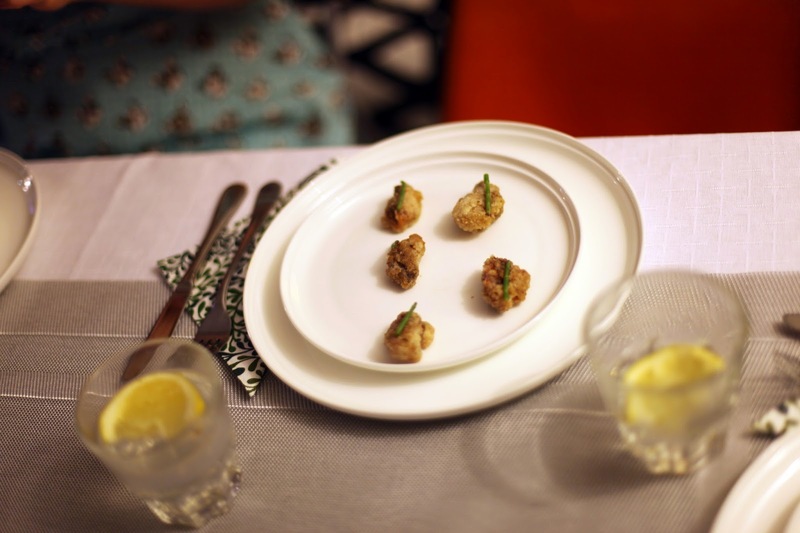 Sea Bounty Mussels is one notable exception, and we decided to serve it as the evening's amuse bouche. A seemingly simple dish of Australian Blue Mussels rolled through a rye and potato starch crumb before being fried and topped with a wild sea succulent, its the kind of dish the seems all to simple - until you actually try it. Cooked for precisely 35 seconds, the mussels encased within the slightly sour crumb are incredibly juicy and fresh - a perfect amuse bouche. I was pretty happy with the dish I put up, however I know I had to make some compromises that would have prevented it from being exactly like what we ate at Attica. Shewry specifically uses Blue Mussels from Sea Bounty Farm in Victoria due to their consistency, however living on the other side of the country, we had to make do with whatever we could get. Additionally, my search for the specific sea succulent used at Attica - sea blight - was not very fruitful, so I had to make do with the more readily available samphire. Due to not wanting to overcook its star ingredient, we were forced to step up A Simple Dish of Potato Cooked In the Earth It Was Grown to be the first course. Quite possibly Shewry's most famous and long-lasting signature dish, its modest title belies just how clever this dish is. Replicating a hangi from Shewry's youth in New Zealand, the potatoes are baked for 7 hours sandwiched between muslin and tea towels and buried in layers of soil. The result is a potato that has truly transmogrified into what everyone agreed was its best possible self; the potato took on a golden colour, a wonderfully aromatic earthiness, and a texture that is difficult to describe as its unlike any other potato I've ever eaten. The remaining components organically flesh out the image of Shewry's flavour memory; sheep's curd and fromage blanc are cold smoked and then mixed together, topped with a sprinkling of ash from a coconut husk, ground coffee and chicken that had been fried to a dry crisp and then blitzed into a chicken floss. To provide a crispy contrast, salt bush leaves are fried and placed as a ring around the potato, which is sat on wild cress leaves. Creamy, smoky, pleasingly sour and texturally interesting - A Simple Dish of Potato was all these things, and Alissa and I liked it so much that we ended up making it again the next weekend. If ever there was a case that vegetables need to be the star ingredient more often, this dish could well prosecute the case. Originally intended to be our first course, Marron, Egg Yolk and Wild Onion Bulbs were served sans wild onion bulbs as our foraging expedition proved fruitless, however many photos online suggest that the wild onion bulbs have been substituted out with other ingredients even at Attica! 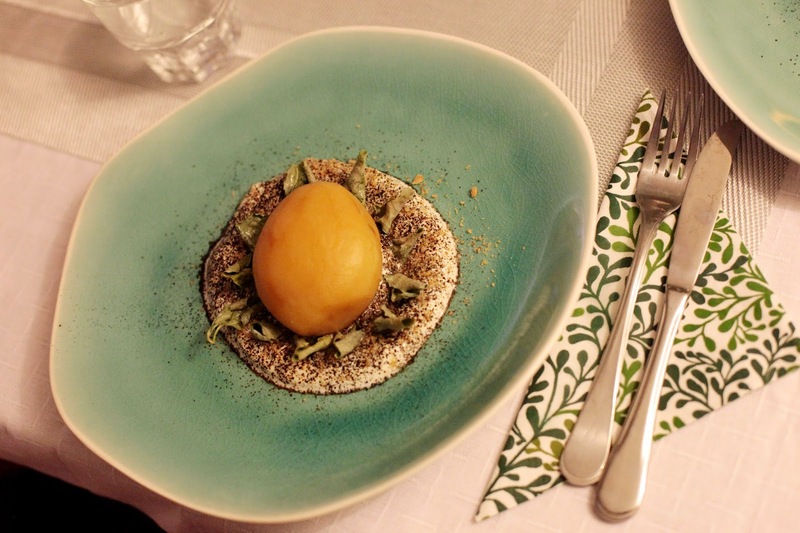 What was on the plate, however, was delicious - A leek was simmered in a vacuum sealed bag, its hollow filled with a decadent, thick sous-vide egg yolk puree and topped with a grilled and dehydrated leek ash. The result was immensely oniony anyway, with our guests loving the custard-like egg yolk puree alongside the intensity of the leek ash. These components complemented the delicate texture of the sous-vide marron tails which were topped with a sliver of torched lardo (cured pork fat) and a drizzling of a deliciously salty and umami-rich prosciutto stock. Having some samphire left over, we decided to place some spears on the plate as a garnish. There were audible 'mmmm! 's and 'yuuuuum! 's from our guests, and a general amazement at the concept of 'prosciutto stock'. 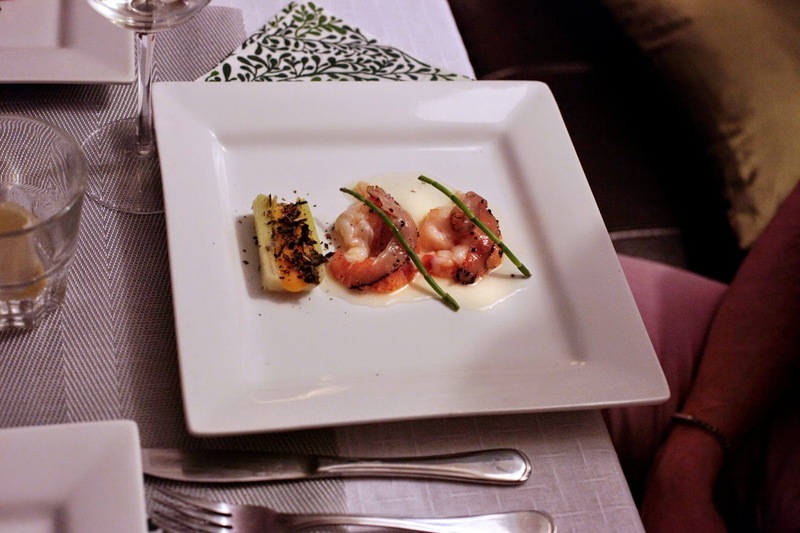 Although this dish is no longer served at Attica, the basic idea of marron/porkiness/onion has been developed and abstracted further into the dish Marron and Ground Greens. With its ramen-like pork fat-rich broth, the more recent dish had its merits too, however this early dish was a veritable crowd pleaser. Seeing Attica's menu today - with the increasing predominance of vegetable-driven dishes and a focus on Australian-specific proteins like Kangaroo, Marron and Barramundi - its hard to imagine that Duck, Smoked Beet Juice, Dried Berries and Cocoa Mass was ever on the menu. However after tasting the final product, there was no doubt that this dish had many of the hallmarks of Shewry's distinctive style. The Duck itself was cooked sous-vide without skin, resulting in a piece of duck breast that was deliciously soft and juicy while being almost uncharacteristically lacking in fattiness - something that impressed my mother greatly. 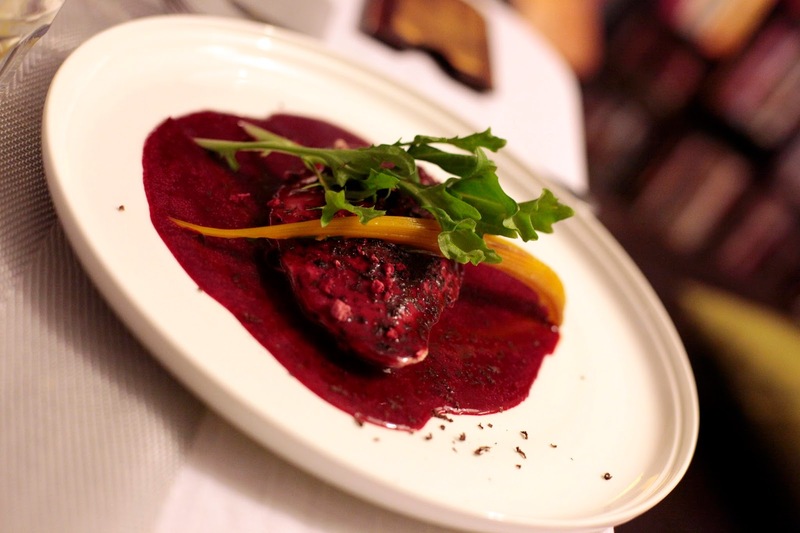 The sauce on top was made from reduced duck stock, cold smoked beetroot juice, vinegar and lemon, with added acidity and crunch coming from freeze dried raspberries and bitter, unsweetened cocoa mass on top. The result had a complex earthiness and sourness that seemed typically Shewryesque. Combined with the sweetness from the beet, it read as a very sophisticated take on Sweet and Sour Sauce. 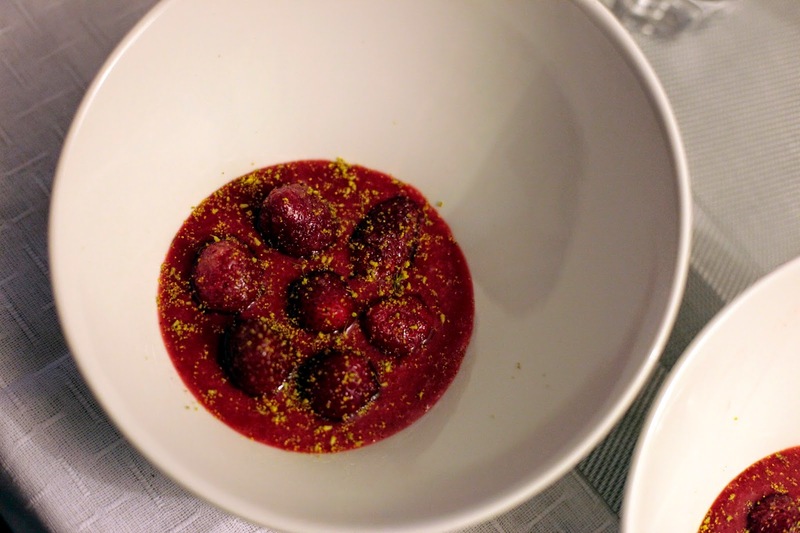 The dish went down a treat with our guests - especially with so many fans of beetroot at the table - and the relatively simplicity of this dish makes it something I would be quite happy to make again. Having initially decided to make petit fours of Shewry's signature Pukeko Egg chocolate dish, a pre-dessert of Strawberries, Soured Cream, Strawberry Oil was a last minute substitution due to the quality of strawberries in season and the humidity making me worry about a repeat of the Eleven Madison Park's chocolate dessert disaster. Clearly an earlier version of the Raw Strawberry Jam dish that Alissa and I were served at Attica, this ended up being the dish I was most proud of, since its making was marred by repeated failure but was saved by making the best of a less that ideal situation. We stuffed up the initial process of making the strawberry oil by blending the strawberries too far; instead of the flavour of the strawberry infusing the oil, the strawberries had broken down and it had become more of an emulsion that would not split enough to extract the oil. With no time to make another batch, I had to improvise. Not having a rotary evaporator to get the raw strawberry flavour, I followed Shewry's alternative non-raw tasting instructions by reducing strawberry juice on the stove. Without an oil to pour in, I instead poured in the already emulsified strawberry and oil mixture. The results were quite good; having the raw strawberry mixed in with the oil reintroduced the raw strawberry flavour to accompany the intensified juice. With a bit of xantham gum added to help thicken it, I was happy to have saved the dish in an acceptable way. Topped with sugar-dusted strawberries and foraged wild fennel pollen, the dish plated up prettily. The home made Soured Cream was poured over at the table, and was itself also a near disaster. I had originally put the cream and buttermilk mixture in the oven at the lowest temperature to get the cream to sour. Unfortunately, we forgot the cream was in there, turned on the grill for another meal and melted the plastic container it was stored in! Luckily, I had made the cream enough days in advance to give me time in case of failure, and I was able to get another batch going in time. While the final dish was not exactly Shewry's dish, it definitely had the spirit of his food, and everyone was amazed by how a dish so seemingly simple - ostensibly strawberries and cream - could be so delicious, and how the aniseed flavour of the fennel flowers really helped elevate the dish. Many around the table said this was their favourite dish of the night - until they tried the final dessert. 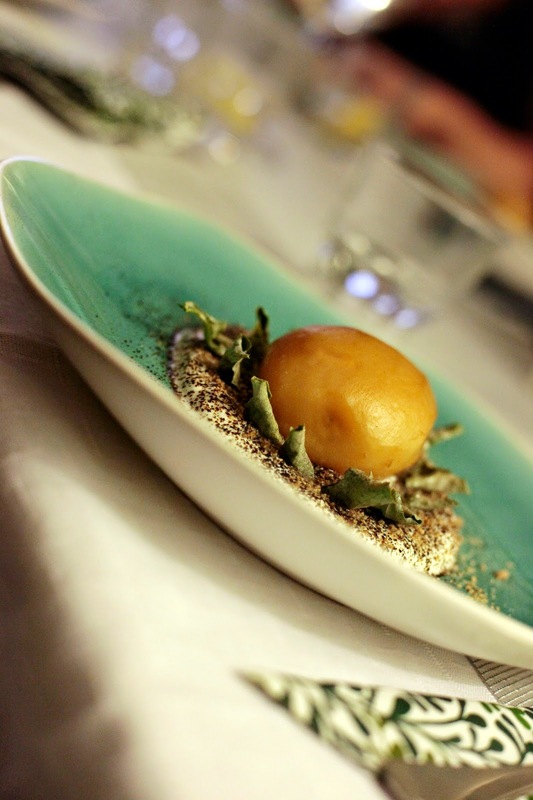 Terroir, an early signature Attica dessert and Shewry's tribute to his father, proved to be a show-stopping finale. 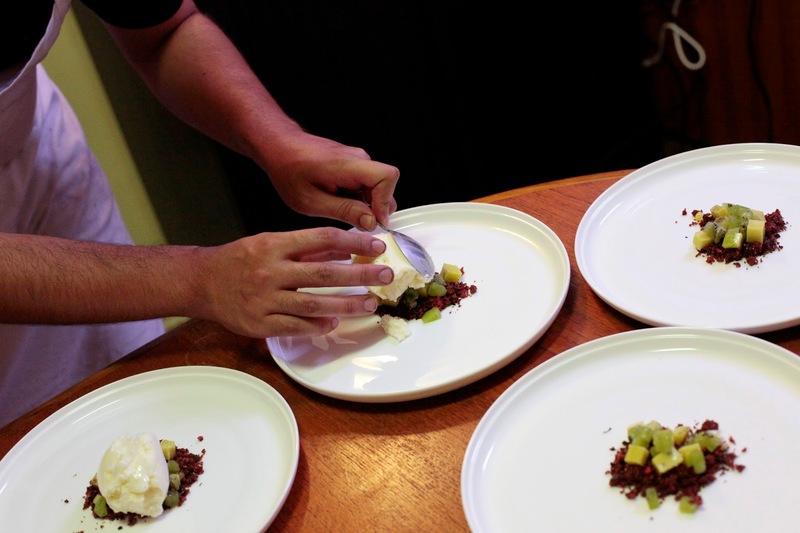 It is a complex and complicated dish, that starts with 'Terroir Base' made from a crumbled up beetroot cake, dehydrated grated beetroot, freeze dried berries, dried cranberries and raspberries, toasted barley, quatre-epices (French four spice) and Murray River salt. 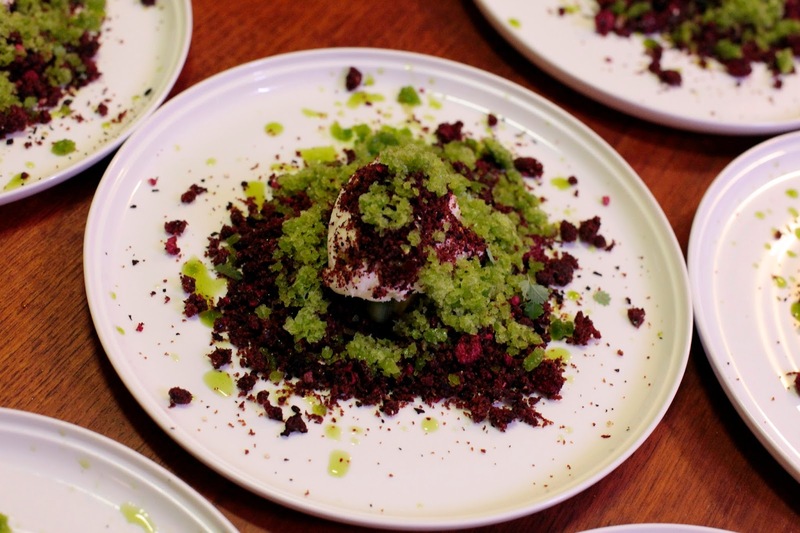 Buried within are pieces of Avocado Jelly and a scoop of Fromage Blanc Sorbet, with a granita of Sorrel Ice spooned on top and garnished with Burnet Leaves. There is so much going on here, but it all works - the Terroir Base has a sweetness and spiciness that reminded us of Christmas, the Avocado Jelly added creaminess and textural interest, the Fromage Blanc Sorbet a yoghurt-like sourness while their was a nice sour grassiness from the Sorrel Ice. There were moments of intensely reverential silence as we all got lost in this incredible dessert. For Alissa, myself and the majority of our guests, this was the dish of the night - and quite possibly the best dessert of our first four dinners. I'd go as far as to say this was one of the best desserts I've ever eaten in my life. Seriously, it was that good. With Attica probably the least well known of our first four dinner themes (the others being Momofuku Ko, Eleven Madison Park and the Fat Duck), I asked everyone for their thoughts on Shewry's food (as cooked by me of course, but its still his ideas and recipes). All agreed that there was a clear and unique artistic voice coming through in all the dishes, without a single weak dish served. I'm pretty hard on myself and have been unhappy with at least one dish in all our dinners, however this was the first dinner with which I thought I did a really good job. Ben Basell and Hayley, having attended four and three of the dinners respectively, agreed that while there were individual dishes from previous dinners that they liked more, this dinner was probably the most consistently excellent of the meals they attended. Cooking from Origin was much easier than the Eleven Madison Park Cookbook (still the gold standard of laborious cooking), however the prep for this meal began long before the Momofuku dinner. Seeing Attica's garden while we were in Melbourne got me inspired to start growing hard to find herbs for cooking, with the Salad Burnet (used as a garnish on Terroir) one such example. It has an interesting cucumber-like flavour that is very tasty and surprisingly underrated. We also planted Large Leaf Sorrel after seeing it used at both Vue de Monde and Attica. ... and then repeatedly worked with a fork until a granita was formed. Shewry likes using the texture of granitas in his desserts. On top of growing our own herbs, many of the ingredients were foraged. Fennel grows wild throughout much of Cockburn, with the flowers used in the Strawberries and Soured Cream dish. ... while Saltbush seems to be a favourite of local councils along the Swan River. Living in Western Australia, we are really lucky to have relatively easy access to Marron. Still, being able to source them for a reasonable price was a bit of a chore. Our local seafood specialist had an asking price of $90/kilo which seemed outrageously steep. A friend who worked at Rockpool suggested I get in touch with True Blue Marron, and their $50/kilo (plus postage) asking price was a lot better even though they have a 3kg minimum order. The marron came live to our door, and thankfully I was able to get a co-worker to pick up the extra 1.5 kilos I didn't need. When we dined at Attica, our friend Bendog quipped that they seemed to use a lot of different curds made from a plethora of different milks. Unsurprisingly, Shewry's recipes called for a bit of home cheese making in the form of Fromage Blanc. Milk was warmed, Fromage Blanc culture added and the kept at a warm temperature to curdle. After the whey was drained out, the resulting curd tasted like something between yoghurt and cream cheese. After tasting it, I don't think I can bring myself to by Philadelphia Cheese again without thinking about how much better Fromage Blanc is. Sous-vide and Immersion Circulator-based cooking were required for both the protein-based recipes. Not having a chamber vacuum sealer, I've realised that there are 3 different ways around this that are specific to the application. In most cases, our domestic vacuum sealer does the trick, but for the egg yolk puree, a zip lock bag was required as the vacuum sealer would have sucked up the yolk. Likewise, the infusion for the failed Strawberry Oil could not be done in a bag. Instead, a vacuum sealable plastic container was used. ...resulting in intensely flavoured dried flakes. The colours were amazing - like fallen leaves in Autumn. ... that were then crushed into breadcrumbs. This was then mixed with potato and modified starches. ... before these too was dehydrated. The intensely oniony flavour combined with the slight marine saltiness of the black squid ink was incredible - I can imagine this component being ground into a powder and used to flavour chips, or dehydrated leek pieces flattened into sheets and eaten as crisps themselves. ...before the husks were set on fire in a barbecue. It took a long while to get going with my dinky kitchen blow torch, and I was slightly puzzled as to why Shewry would warn that it burns intensely. Oh right... it may take a while to get going but when it does, coconut husk burns like crazy. As the pillar of flames burned furiously, I was worried it would lick the wooden beams of our patio. Thankfully no house fires were started. .. and ground them in a spice grinder, ready for use in A Simple Dish of Potato Cooked in the Earth It Was Grown. I love new toys, and the need to cold smoke a few components served as a good excuse to get my hands on a Polyscience Smoking Gun. ... while blowing the resulting smoke out of the supplied hose. This is an elegantly simple device, however I thought that it did not get as smoky as I needed it to with a single dose of smoking. With some trial, I've found a second dose of smoke from the Smoking Gun resulted in the desired depth of flavour. ... and Prosciutto was added. The resulting stock was a revelation - deliciously salty and umami, its the kind of thing that sounds rather novel, but once we tried it it seemed like something that should have always existed. I have had Beetroot Cakes before, and they've usually been Carrot Cakes made with an ingredient substitution. Shewry's version is a bit more complicated, and required beetroot juice to be seriously reduced on the stove. And I do mean seriously. It was so reduced it ended up as a thick paste! Alissa, a better and more intuitive baker than I am, made the cake. The result was good. Really good, and Alissa was a bit disappointed at first when I said I was going to be crumbling it up. With a bit of Cream Cheese and walnuts, this would actually make a pretty good Carrot Cake-style Beetroot Cake in its own right. Still, the most unorthodox cooking method I had to employ would have to be the makeshift oven hangi/baked in soil method used for Potato Cooked in the Earth it Was Grown. Although I'm sure the fecund soils of a potato farm taste even better, I had to settle on soil from the backyard. I filled in the first layer of sand. Tea towels and muslin were placed on the soil, and the potatoes were then laid out on top. ... before the final soil layer was placed on top, covered in foil and baked for 7 hours. Special mention for some of the hidden ingredients in Terroir. At the base was a pile of Avocado Jelly made with Avocado Oil. These had a great creamy flavour, and although set with gelatine had a firmer set akin to agar agar - a touch that recalled Asian desserts. Finally - Fromage Blanc Sorbet. Wow. Imagine the best Frozen Yoghurt you've had, and imagine it even better. That is what Fromage Blanc Sorbet is like. 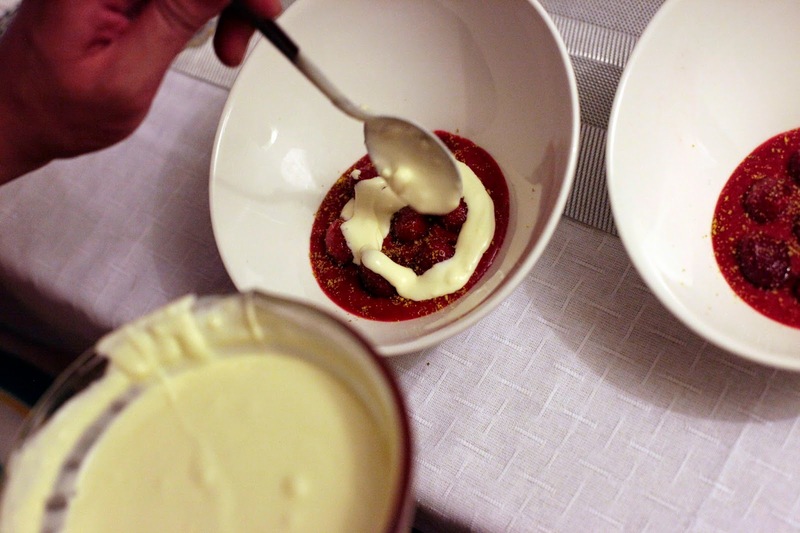 I liked it so much that we ended up giving our guests much larger scoops of it, a move that was much appreciated. Origin: The Food of Ben Shewry is easily one of my most treasured cookbooks. Its a wonderful read filled with autobiographical information, and it was a pleasure to cook from. Compared to the preceding dinners, I would consider Origin to be somewhere between the Fat Duck and Momofuku Ko in terms of complexity (and a lot less laborious than Eleven Madison Park) - although foraging and growing your own herbs seems a crucial aspect of his style of cooking. The recipes are well written and quantities that each subrecipe yields makes sense - I did not have to make the same maddening calculations that were required for the Fat Duck dinner for instance. It was a lot of fun, and the experience of foraging was as much as learning experience as using liquid nitrogen was for the Fat Duck dinner. More than that though, I've now caught the bug of wanting to grow even more of my own produce, and I look forward to more nursery shopping for the exciting dinners planned for 2015. Thanks Kristy! It always seems like something doesn't go quite as planned so it was nice to have it go so well, even with the stuff ups making the Strawberry and Soured Cream dish. Also, I think after attempting Eleven Madison Park, everything seems less complicated by comparison! Can't wait to dine at Attica one day! I've heard that one of the best things you can eat is a freshly dug potato, all the potatoes we usually buy have been out of the ground for weeks. Sounds like baking the potato in it's natural environment is amazing and replicable at home. Thanks for the step by step photos. Growing your own herbs/vegetables is dedication dude. Your house with all the ingredients you are stocking up on and gardening is morphing into a mini restaurant! Attica is definitely worth the effort it takes to book, and with a menu that is always changing it is somewhere I would definitely like to visit again. Most of the dishes currently served are new since we were last there! I wish we could have used a potato straight from the ground! Our heirloom tomatoes are tasting so good straight from the vine, so I can imagine potatoes being much the same. Baking the potatoes in soil really made all the difference - we tried cooking a potato sous-vide for comparison, and the texture was no where near as good, and it lacked the mushroomy, earthy flavour of the soil baked potato. You are one crazy dude MoG! Its a bloody massive effort there. Every bit as priceless as the description and product. Amazing post :)! Thanks man! I have to say that its getting easier to manage these dinners. Rhe Eleven Madison Park dinner was a great baptism by fire in that regard; it still remains the most fiendishly difficult of the dinners.